Viticulture (from the Latin word for vine) or winegrowing (wine growing) is the cultivation and harvesting of grapes. It is a branch of the science of horticulture. While the native territory of Vitis vinifera, the common grape vine, ranges from Western Europe to the Persian shores of the Caspian Sea, the vine has demonstrated high levels of adaptability to new environments. For this reason, viticulture can be found on every continent except Antarctica. Duties of the viticulturist include monitoring and controlling pests and diseases, fertilizing, irrigation, canopy management, monitoring fruit development and characteristics, deciding when to harvest, and vine pruning during the winter months. Viticulturists are often intimately involved with winemakers, because vineyard management and the resulting grape characteristics provide the basis from which winemaking can begin. A great number of varieties are now approved in the European Union as true grapes for winegrowing and viticulture. The earliest evidence of grape vine cultivation and winemaking dates back 7,000 years. The history of viticulture is closely related to the history of wine, with evidence that humans cultivated wild grapes to make wine as far back as the Neolithic period. Evidence suggests that some of the earliest domestication of Vitis vinifera occurred in the area of the modern countries Georgia and Armenia. The oldest-known winery was discovered in the "Areni-1" cave in Vayots Dzor, Armenia. Dated to c. 4100 BC, the site contained a wine press, fermentation vats, jars, and cups. Archaeologists also found V. vinifera seeds and vines. Commenting on the importance of the find, McGovern said, "The fact that winemaking was already so well developed in 4000 BC suggests that the technology probably goes back much earlier." There is also evidence of grape domestication in the Near East in the early Bronze Age, around 3200 BC. Evidence of ancient viticulture is provided by cuneiform sources (ancient writing on clay tablets), plant remains, historical geography, and archaeological excavations. The remnants of ancient wine jars have been used to determine the culture of wine consumption and cultivated grape species. In addition to winemaking, grapes have been grown for the production of raisins. The earliest act of cultivation appears to have been the favoring of hermaphroditic members of the Vitis vinifera species over the barren male vines and the female vines, which were dependent on a nearby male for pollination. With the ability to pollinate itself, over time the hermaphroditic vines were able to sire offspring that were consistently hermaphroditic. The period that Thucydides was most likely referencing was the time between 3000 BC and 2000 BC, when viticulture emerged in force in Asia Minor, Greece, and the Cyclades Islands of the Aegean Sea. During this period, grape cultivation developed from an aspect of local consumption to an important component of international economies and trade. From 1200 BC to 900 BC, the Phoenicians developed viticulture practices that were later used in Carthage. Around 500 BC, the Carthaginian writer Mago recorded such practices in a two-volume work that was one of the few artifacts to survive the Roman destruction of Carthage during the Third Punic War. The Roman statesman Cato the Elder was influenced by these texts, and around 160 BC he wrote De Agricultura, which expounded on Roman viticulture and agriculture. Around 65 AD, the Roman writer Columella produced the most detailed work on Roman viticulture in his twelve-volume text De Re Rustica. Columella's work is one of the earliest to detail trellis systems for raising vines off the ground. Columella advocated the use of stakes versus the previously accepted practice of training vines to grow up along tree trunks. The benefits of using stakes over trees was largely to minimize the dangers associated with climbing trees, which was necessary to prune the dense foliage in order to give the vines sunlight, and later to harvest them. Roman expansion across Western Europe brought Roman viticulture to the areas that would become some of the world's best-known winegrowing regions: the Spanish Rioja, the German Mosel, and the French Bordeaux, Burgundy and Rhône. Roman viticulturists were among the first to identify steep hillsides as one of the better locations to plant vines, because cool air runs downhill and gathers at the bottom of valleys. While some cool air is beneficial, too much can rob the vine of the heat it needs for photosynthesis, and in winter it increases the risk of frost. In the Middle Ages, Catholic monks (particularly the Cistercians) were the most prominent viticulturists of the time period. Around this time, an early system of Metayage emerged in France with laborers (Prendeur) working the vineyards under contractual agreements with the landowners (Bailleur). In most cases, the prendeurs were given flexibility in selecting their crop and developing their own vineyard practice. In northern Europe, the weather and climate posed difficulties for grape cultivation, so certain species were selected that better suited the environment. Most vineyards grew white varieties of grape, which are more resistant to the damp and cold climates. 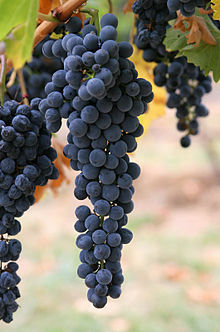 A few species of red grape, such as the Pinot Noir, were also introduced. Les Très Riches Heures du duc de Berry dates back to 1416 and depicts horticulture and viticulture in France. The images illustrate peasants bending down to prune grapes from vines behind castle walls. Additional illustrations depict grape vines being harvested, with each vine being cut to three spurs around knee height. Many of the viticultural practices developed in this time period would become staples of European viticulture until the 18th century. Varietals were studied more intently to see which vines were the most suitable for a particular area. Around this time, an early concept of terroir emerged as wines from particular places began to develop a reputation for uniqueness. The concept of pruning for quality over quantity emerged, mainly through Cistercian labors, though it would create conflict between the rich landowners who wanted higher quality wines and the peasant laborers whose livelihood depended on the quantity of wine they could sell. The Riesling is the famous example for higher quality of wine. In 1435 Count John IV. of Katzenelnbogen started this successful tradition. In Burgundy, the Cistercian monks developed the concept of cru vineyards as homogeneous pieces of land that consistently produce wines each vintage that are similar. In areas like the Côte-d'Or, the monks divided the land into separate vineyards, many of which are still in existence today- like Montrachet and La Romanée. In Greek mythology, the demigod Dionysus (Bacchus in Roman mythology), son of Zeus, invented the grapevine and the winepress. When his closest satyr friend died trying to bring him a vine Dionysus deemed important, Dionysus forced the vine to bear fruit. His fame spread, and he finally became a god. The vast majority of the world's wine-producing regions are found between the temperate latitudes of 30° and 50° in each hemisphere. Within these bands, the annual mean temperatures are between 10 and 20 °C (50 and 68 °F). The presence of large bodies of water and mountain ranges can have positive effects on the climate and vines. Nearby lakes and rivers can serve as protection for drastic temperature drops at night by releasing the heat that the water has stored during the day to warm the vines. The grape is classified as a berry. On the vine, grapes are organized through systems known as clusters. Grape clusters can vary in compactness which can result in long clusters (resulting in the grapes spreading out) or short clusters (resulting in grapes packed together). In some grape species, clusters ripen collectively which allow them to be harvested together. For others, grapes may ripen individually within a cluster. Each grape berry contains a pedicel which attaches to the rachis. The main function of the rachis is to allow the grapes receive their water and nutrients. The pollination and fertilization of grapes results in one to four seeds within the berry. When fertilization does not occur, seedless grapes are formed, which are sought after for the production of raisins. Regardless of pollination and fertilization, most plants will produce around 100 to 200 grapes. The skin of the grape accounts for 5 to 20% of the total weight of a grape depending on the variety. When grape skin ripens, it contains the majority of the aromatic substances and tannin. These factors become important in winemaking for methods including color extraction or aroma dissolution. Although the skin contains the majority of the tannin, small percentages can be found throughout the grape and during all of its developmental stages. However, the tannin's most important role is during the grape's ripening stage as its function is to formulate color and body shape. Although many factors can affect the overall quality of a grape vine, the three most important are climate, slope, and soil, often collectively referred to as the terroir. Climate is the most significant factor in determining a grape's inherent qualities. Each grape species has a uniquely preferred environment for ideal growing. Because climates vary from country to country, selecting the best strain is an important decision in grape cultivation. In addition, because climatic factors such as temperature and rain can be unpredictable and uncontrollable, each year will produce unique qualities and yields of grapes. Grape vines need approximately 1300–1500 hours of sunshine during the growing season and around 690 millimetres (27 in) of rainfall throughout the year in order to produce grapes suitable for winemaking. In ideal circumstances, the vine will receive most of the rainfall during the winter and spring months: rain at harvesttime can create many hazards, such as fungal diseases and berry splitting. The optimum weather during the growing season is a long, warm summer that allows the grapes the opportunity to ripen fully and to develop a balance between the levels of acids and sugars in the grape. Hot and sunny climates have a frost-free growing season of 200 days or more. These climates allow grapes to ripen faster with higher sugar levels and lower acidity. Cooler climates have a frost-free growing season of around 150–160 days. Cooler seasons force the grapes to ripen earlier which produces a fresher and more acidic harvest. In general, the average yearly temperature for most crops should average around 15 °C (59 °F) in order for the highest quality to be achieved in each grape. Summer: Ideal temperatures in summer average around 22 °C (72 °F). Ideal summer temperatures enable fruits to ripen. Temperature and sunshine are the most important factors in ripening. Winter: Ideal temperatures in winter average around 3 °C (37 °F). Ideal winter temperatures are necessary to allow grape vines to enter their resting phase. If temperatures fall too low, the crops can be injured. Spring and Fall: Spring and fall are critical seasons for grape development, because the plants are susceptible to frost damage, which can injure the fruiting buds. Wet weather in spring can increase the odds of mildew formation. To prevent mildew, some farms introduce devices such as heaters or large fans in vineyards. However, such solutions can be costly. Examples of downy and powdery mildew on a grape leaf. A viticulturist faces many hazards that can have an adverse effect on the wine produced from the grape or kill the vine itself. When the vine is flowering, it is very susceptible to strong winds and hail. Cold temperatures during this period can lead to the onset of millerandage, which produces clusters with no seeds and varying sizes. Hot conditions can produce coulure that causes grape clusters to either drop to the ground or not fully develop. Oidium is a powdery mildew that can attack all green parts of the vine. If left untreated, oidium can be terminal for the plant. It thrives in cooler temperatures and in the shade. Some North American vine species have evolved to show resistance to the mildew (3:37). Downy mildew (Peronospora) thrives in high temperatures and humidity and produces stains on leaves. It can be treated by spraying plants with copper sulphate. Most American vines are resistant, excluding Vitis vinifera. Fanleaf virus is spread by nematodes that breed in the vine stem. It can lead to deformity, yellowing of leaves, and smaller crop yields. There is no cure for the plant; the best course of action is to remove infected plants and leave the remaining roots to rot. A green harvest is the removal of immature grape bunches, typically for the purpose of decreasing yield. The removal of the bunches while they are still green induces the vine to put all its energy into developing the remaining grapes. In theory this results in better ripening and the development of more numerous and mature flavour compounds. In the absence of a green harvest, a healthy, vigorous vine can produce dilute, unripe grapes. In Europe, many appellations restrict the yield permitted from a given area, so there is even more incentive to perform green harvesting when presented with excess crop. Often, the excess must be sold for a pittance and used for industrial alcohol production rather than wine. A field blend is a wine that is produced from two or more different grape varieties interplanted in the same vineyard. In the days before precise varietal identification, let alone rigorous clonal selection, a vineyard might be planted by taking cuttings from another vineyard and therefore approximately copying its genetic makeup. This meant that one vine could be Zinfandel and the next Carignan. When making wine with little equipment to spare for separate vinification of different varieties, field blends allowed effortless, though inflexible, blending. Fermentation tanks are now cheap enough that the field blend is an anachronism, and almost all wines are assembled by blending from smaller, individual lots. However, in California some of the oldest (and lowest-yielding) Zinfandel comes from vineyards that are field-blended. Ridge Vineyards owns the Lytton Springs vineyards in Sonoma County, which were planted from 1900 to 1905 in what Ridge calls "a traditional field blend of about seventy percent Zinfandel, twenty percent Petite Sirah, and ten percent Grenache and Carignan." Gemischter Satz (Mixed set) is a wine term in German equivalent to a field blend, which means that grapes of different varieties are planted, harvested and vinified together. In older times, this was common, but the practice has almost stopped. It is, however, a specialty of Vienna. ^ Johnson, H. (1989). Vintage: The Story of Wine. Simon & Schuster. pp. 17–19. ISBN 0-671-68702-6. ^ Philips, Roderick (2000). A Short History of Wine. New York: Ecco. ^ "Books: Roots of the Vine". Archaeology.org. Retrieved 2012-02-12. ^ David Keys (28 December 2003). "Now that's what you call a real vintage: professor unearths 8,000-year-old wine". The Independent. independent.co.uk. Retrieved 13 January 2011. ^ Mark Berkowitz (September–October 1996). "World's Earliest Wine". Archaeology. Archaeological Institute of America. 49 (5). Retrieved 13 January 2011. ^ a b "'Oldest known wine-making facility' found in Armenia". BBC News. BBC. 11 January 2011. Retrieved 13 January 2011. ^ Thomas H. Maugh II (11 January 2011). "Ancient winery found in Armenia". Los Angeles Times. Los Angeles Times Media Group. Retrieved 13 January 2011. ^ McGovern, Patrick (1996). The Origins and Ancient History of Wine. Amsterdam, The Netherlands: Gordon and Breach. p. 99. ^ McGovern, Patrick (1996). The Origins and Ancient History of Wine. Amsterdam, The Netherlands: Gordon and Breach. p. 198. ^ McGovern, Patrick (1996). The Origins and Ancient History of Wine. Amsterdam, The Netherlands: Gordon and Breach. p. 104. ^ Johnson, H. (1989). Vintage: The Story of Wine. Simon & Schuster. p. 18. ISBN 0-671-68702-6. ^ Johnson, H. (1989). Vintage: The Story of Wine. Simon & Schuster. p. 35. ISBN 0-671-68702-6. ^ Johnson, H. (1989). Vintage: The Story of Wine. Simon & Schuster. pp. 35–39. ISBN 0-671-68702-6. ^ Johnson, H. (1989). Vintage: The Story of Wine. Simon & Schuster. p. 61. ISBN 0-671-68702-6. ^ Johnson, H. (1989). Vintage: The Story of Wine. Simon & Schuster. p. 68. ISBN 0-671-68702-6. ^ Johnson, H. (1989). Vintage: The Story of Wine. Simon & Schuster. pp. 82–92. ISBN 0-671-68702-6. ^ Johnson, H. (1989). Vintage: The Story of Wine. Simon & Schuster. p. 116. ISBN 0-671-68702-6. ^ a b c Unwin, Tim (1991). Wine and the Vine: An Historical Geography of Viticulture and the Wine Trade. London: Routledge. p. 169. ^ Unwin, Tim (1991). Wine and the Vine: An Historical Geography of Viticulture and the Wine Trade. London: Routledge. p. 171. ^ Johnson, H. (1989). Vintage: The Story of Wine. Simon & Schuster. pp. 121–122. ISBN 0-671-68702-6. ^ "Katzenelnbogener Weltrekorde: Erster RIESLING und erste BRATWURST!". Graf-von-katzenelnbogen.de. Retrieved 2012-02-12. ^ Johnson, H. (1989). Vintage: The Story of Wine. Simon & Schuster. pp. 131–132. ISBN 0-671-68702-6. ^ a b Fraga, H., Garcia de C. A. I., Malheiro, A.C., Santos, J.A., 2016. Modelling climate change impacts on viticultural yield, phenology and stress conditions in Europe. Global Change Biology: doi:10.1111/gcb.13382. ^ a b Ribéreau-Gayon, P (2000). Handbook of Enology Vol. 1. Chichester, West Sussex, England: John Wiley. p. 220. ^ Vine, Richard (1997). Winemaking: From Grape Growing to Marketplace. New York: Chapman & Hall. p. 24. ISBN 9780412122217. ^ Ribéreau-Gayon, P (2000). Handbook of Enology Vol. 1. Chichester, West Sussex, England: John Wiley. p. 221. ^ Vine, Richard (1997). Winemaking: From Grape Growing to Marketplace. New York: Chapman & Hall. p. 223. ISBN 9780412122217. ^ a b Unwin, Tim (1991). Wine and the Vine: An Historical Geography of Viticulture and the Wine Trade. London: Routledge. p. 36. ^ Vine, Richard (1997). Winemaking: From Grape Growing to Marketplace. New York: Chapman & Hall. p. 224. ISBN 9780412122217. ^ a b c d e f Unwin, Tim (1991). Wine and the Vine: An Historical Geography of Viticulture and the Wine Trade. London: Routledge. p. 42. ^ a b Stevenson, T. (2005). The Sotheby's Wine Encyclopedia. pp. 14–15. ISBN 0-7566-1324-8. ^ a b Vine, Richard (1997). Winemaking: From Grape Growing to Marketplace. New York: Chapman & Hall. p. 26. ISBN 9780412122217. ^ Stevenson, T. (2005). The Sotheby's Wine Encyclopedia. p. 16. ISBN 0-7566-1324-8. ^ a b c Vine, Richard (1997). Winemaking: From Grape Growing to Marketplace. New York: Chapman & Hall. p. 27. ISBN 9780412122217. ^ a b Unwin, Tim (1991). Wine and the Vine: An Historical Geography of Viticulture and the Wine Trade. London: Routledge. p. 44. ^ Unwin, Tim (1991). Wine and the Vine: An Historical Geography of Viticulture and the Wine Trade. London: Routledge. p. 37. ^ Unwin, Tim (1991). Wine and the Vine: An Historical Geography of Viticulture and the Wine Trade. London: Routledge. p. 38. ^ a b Unwin, Tim (1991). Wine and the Vine: An Historical Geography of Viticulture and the Wine Trade. London: Routledge. p. 39. Francesco Emanuelli; Silvia Lorenzi; Lukasz Grzeskowiak; Valentina Catalano; Marco Stefanini; Michela Troggio; Sean Myles; José M. Martinez-Zapater; Eva Zyprian; Flavia M. Moreira & M. Stella Grando (2013). "Genetic diversity and population structure assessed by SSR and SNP markers in a large germplasm collection of grape". BMC Plant Biology. BioMed Central Ltd. 13: 39. doi:10.1186/1471-2229-13-39. PMC 3610244. PMID 23497049. McCoy, Elin. The Emperor of Wine. NY: HarperCollins, 2005. Abu-Hamdeh, N.H. 2003. Compaction and subsoiling effects on corn growth and soil bulk density. Soil Society of America Journal. 67:1213-1219. Conradie, W.J., J.L. Van Zyl, P.A. Myburgh. 1996. Effect of soil preparation depth on nutrient leaching and nutrient uptake by young Vitis vinifera L.cv Pinot noir. South African Journal of Enol. Vitic. 17:43-52. Dami, I.E., B. Bordelon, D.C. Ferree, M. Brown, M.A. Ellis, R.N. William, and D. Doohan. 2005. Midwest Grape Production Guide. The Ohio State Univ. Coop. Extension. Service. Bulletin. 919-5. Kurtural, S.K. 2007. Desired Soil Properties for Vineyard Site Selection. University of Kentucky Cooperative Extension Service. HortFact – 31- 01. Kurtural, S.K. 2007. Vineyard Design. University of Kentucky Cooperative Extension Service. HortFact – 3103. Kurtural, S.K. 2007. Vineyard Site Selection. University of Kentucky Cooperative Extension Service. HortFact – 31-02. Phin, John. 1862 (still in print). Open Air Grape Culture : A Practical Treatise On the Garden and Vineyard Culture of the Vine, and the Manufacture of Domestic Wine Designed For the Use of Amateurs and Others. Schonbeck, M.W. 1998. Cover Cropping and Green Manuring on Small Farms in New England and New York. Research Report #10, New Alchemy Institute, 237 Hatchville Rd. Falmouth, MA 02536. Tesic, Dejan, M. Keller, R.J. Hutton. 2007. Influence of Vineyard Floor Management Practices on Grapevine Vegetative Growth, Yield, and Fruit Composition. American Journal of Enol. Vitic. 58:1:1-11. Zabadal, J.T. Anderson, J.A. Vineyard Establishment I – Preplant Decisions. MSU Extension Fruit Bulletins – 26449701. 1999. Tesic, Dejan, M. Keller, R.J. Hutton. Influence of Vineyard Floor Management Practices on Grapevine Vegetative Growth, Yield, and Fruit Composition. American Journal of Enol. Vitic. 58:1:1-11. 2007. Wikimedia Commons has media related to Viticulture.